Download the PDF version (399 KB) of this content. The transportation and warehousing sector facilitates the transportation of cargo and passengers, as well as the warehousing and storage of goods. It also includes tourism transportation and other support activities. Transportation and warehousing accounted for 5.2% of Western Canada's gross domestic product (GDP) in 2017,1 and employed 344,700 people across the region.2 Employment growth in this industry saw a marked improvement in 2017 compared to one year prior, thanks to favourable economic conditions that encouraged higher trading volumes. Going forward, the outlook for the sector is expected to be positive due to the increasing demands of a growing population, and a weakened Canadian dollar that is facilitating exports. The rise of e-commerce, at growth rates that have vastly exceeded sales at brick and mortar stores, has been a driving factor behind the expansion of the transportation and warehousing sector. Online shopping is expected to continue to have a positive impact on the sector over the medium-term. A weaker Canadian dollar and new direct flight connections to Canada have resulted in a record number of international arrivals by plane. The number of passengers visiting Canada from overseas, increased by 6.6 percent in 2017, a record-high. This trend is expected to continue as the sector works to meet the travel demands of a growing world population. Low oil prices have positively impacted many transportation firms as fuel costs represent a significant proportion of operational costs. Conversely, oil and gas extraction industries may see a reduced need for transportation services if global demand for their products remains weak. Pipeline capacity constraints in Western Canada are positively impacting the demand for shipment via rail. With Alberta now producing more oil than it can move to export markets, the oil and gas sector will have to compete with other industries such as agriculture and manufacturing for rail space. The impact of the transportation sector on the economy at large varies widely from one jurisdiction to the next. In 2017, the smallest economic impact was felt in Nunavut, where transportation and warehousing accounted for 2.4% of the territory's GDP.4 In contrast, the sector comprised 6.4% of Manitoba's economy during the same year. Air transportation: This industry employs 9.3% of all workers in the transportation and warehousing sector in Western Canada.9 The movement of passengers and cargo is the key component of air transportation. Western Canada houses five of the country's busiest airports by cargo – Vancouver, Calgary, Edmonton, Winnipeg, and Victoria. Calgary is also the base for WestJet operations. In 2017, Western Canada transported over 491,000 tonnes of cargo (domestic and international) by air, through nearly 45,800 flights10 - accounting for 37.4% of Canada's air freight that year. During the same time period, Vancouver International Airport handled 21.8% of Canada's air freight traffic.11 Meanwhile, passenger traffic at Western Canada's airports reached nearly 65 million in 2017 – a 6.6% increase from the year prior and a record high for the region.12 Most of this year over year growth occurred in BC (+60.1%), with passenger traffic increasing in all but one province (Saskatchewan).13 A weaker exchange rate, and new direct air connections have boosted the number of international visitors to Western Canada; a trend that will have positive spillover effects on transportation employment in tourism related sub-sectors. Rail transportation: The resource-rich western provinces and territories ship the largest percentage of goods by rail in Canada. In 2017, Western Canada carried 59.6% (220 thousand rail cars) of all rail cargo in the country.14 Not surprisingly, the top five most transported goods (by rail cars) in the west are byproducts of agriculture and resource extraction; coal, wheat, potash, and canola.15 Export figures (January through October) show a 31.8% increase in the volume of crude oil shipped by rail in 2018 compared to the same period last year.16 This is set to rise further still; as producers in Alberta now extract more crude than can be exported by pipeline. To accommodate the increase in demand for rail services, the Government of Alberta invested about $1.0 billion to increase rail take away capacity, with locomotives and tanker cars scheduled for delivery by the end of 2019. Truck transportation: In 2017, truck transportation accounted for 32.8% (113,000) of all transportation and warehousing employment in the western provinces.17 Truck transportation represents a particularly large portion of all transportation and warehousing jobs both in Saskatchewan and Manitoba – 41.3% and 43.7% respectively. The 2017 signing of the Canada Free Trade Agreement, which aims to remove interprovincial trade barriers, is set to deliver significant economic gains for western provinces, and positively impact truck transportation employment in particular.18 Furthermore, recent technological advances in truck communication systems - such as GPS scheduling trackers, speed monitors and fuel consumption maximization - are increasing the trucking industry's productivity and improving its safety record. Marine transportation: BC is home to a large water transportation industry, both for passenger and freight traffic. In 2017, international cruise ships carried over 1,328,000 passengers to major Canadian ports, mainly in Vancouver (842,530 passengers), Halifax (292,750) and Quebec City (192,400). Each ship represents an estimated $2 million boost to the local economy. In terms of freight traffic, the Port of Vancouver was Canada's busiest port in 2017, handling 142.1 million metric tonnes of freight, a 5% increase from 2016 volumes. By comparison, Montreal, the country's second busiest port, handled 38.0 million tonnes in 2017.19. The Prairie Provinces should experience employment growth in transportation and warehousing between 2018 and 2020. Among the Prairie Provinces, Alberta will see the most rapid growth, with projected employment increases of 6,800. 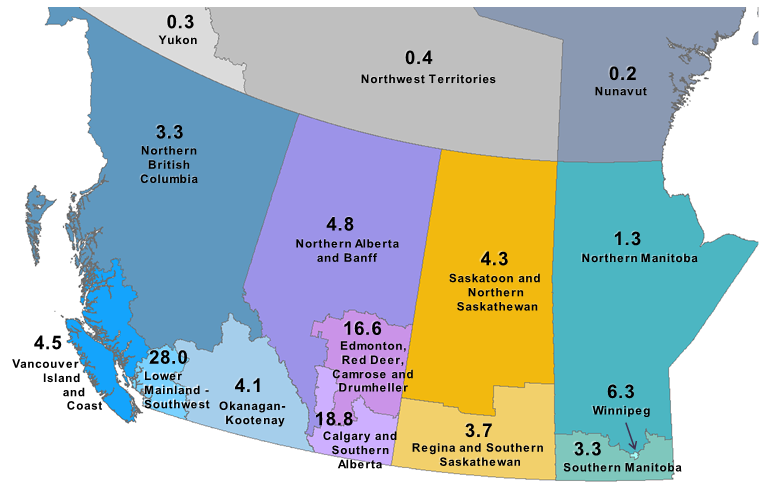 Among the territories, Yukon and Nunavut will see employment grow, while Northwest Territories will see a modest employment loss during that time. 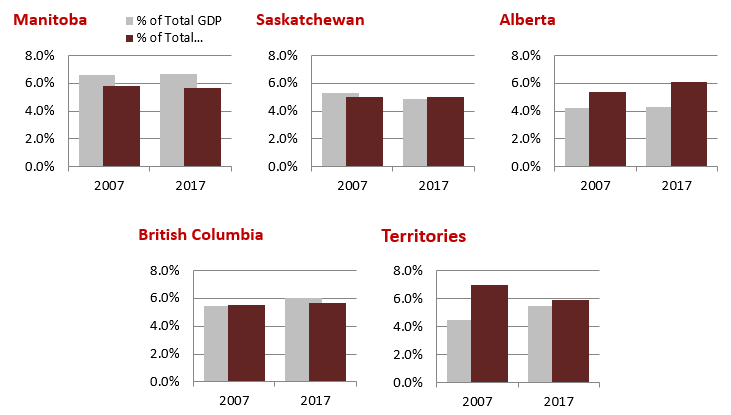 Sector growth will remain the strongest in BC, where employment is expected to advance by 7,700 between 2018 and 2020. Another downside risk to the sector stems from recent changes to NAFTA, which could impede trade flow between Canada, the U.S. and Mexico, and negatively affect regional employment levels. In BC, the Ministry of Transportation and Infrastructure is working to improve driving conditions for truckers. Over the next three years, the province is investing $9 million to improve rest areas, and Wi-Fi connectivity, as well as build new service stations. Meanwhile, talk of driverless or semi-autonomous trucks has gained momentum in the region. Suncor Energy is testing fully automated trucks on an isolated part of the company's oil sands operations north of Fort McMurray.24 That said this new technology will have to go through a rigorous regulatory process before autonomous trucks become commonplace. Also in BC, and as part of previously announced plans to improve transportation in Metro Vancouver, Translink is looking to hire over 500 bus drivers as the company adds new routes to its service.25 The province also recently introduced legislation that begins the process of allowing ride-hailing companies to start operations in late 2019.26 Meanwhile, in Saskatchewan, the city of Saskatoon approved bylaws that now allow companies such as Uber and Lyft to operate in the city. In warehousing, Amazon Inc. hired 1,000 full-time employees for its new fulfilment centre near Calgary.28 The company also plans to open a 1 million square foot warehouse near Edmonton; providing 600 new jobs when it opens in 2020. Funding for a project set to connect the proposed deep water port at Grays Bay to the winter road that services N.W.T. 's diamond mines was rejected by Transport Canada in April 2018. N.W.T. offered to build its own all-weather link however, Nunavut pulled its support for Grays Bay. A number of groups have vowed to continue advocating for the 227-­kilometre all­-season road and port project. If it goes ahead, the road could potentially spur exploration in the area and boost employment in Nunavut's transportation and warehousing sector.